The Northshore Hydraulic Platform Boat Lift is designed to keep your boat safe and secure while maintaining a clean look in your boathouse or on your dock. All mechanical components are underneath the decking in the structure of the dock system yet above the water. When the lift is in the upright position, no components are in the water. An aluminum deck box keeps the batteries and other components neatly contained. The lift is simple to operate with a wireless key fob and is hard-wired to a lockable box with a manual switch. 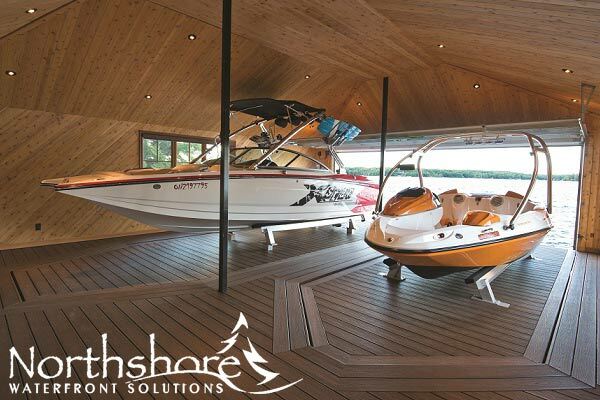 When installed in a boat house, the platform lift provides added security to your boat house and keeps animals/birds from entering the boathouse. Creates a safe environment for children and allows for easy maintenance. Adds square footage to your dock/boathouse as the bunks can be removed. Why our Hydraulic Platform Lift? Check out our video to see how the revolutionary Platform Boat Lift works!